Spurred on by a question from a reader about successful implementation of wireless mesh networks in Africa, I started to do a little digging. The appeal of wireless meshes is especially high in very remote and unconnected areas of Africa, primarily because it allows simple (though limited) connectivity where it wasn’t available before. “The main thrust is to connect the clinic to its community hospice and thus allow them to extend their computer facilities to the hospice (practise management software and statistics gathering). This is most easily achieved through a wireless network and more specifically a mesh because of the terrain. 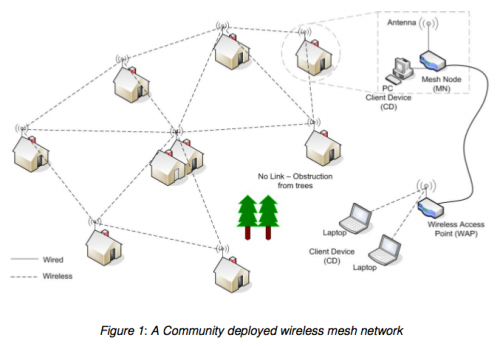 A DIY Wireless Mesh Guide (3.2Mb PDF) based on Freifunk was put out by Wireless Africa late last year. I’m still looking for cases of successful wireless mesh networks in Africa. If you have heard of one, please comment below, or use the contact form. I realize that there have been some larger, industrial strength, deployments by the likes of KDN in Kenya with their Butterfly Network (though I haven’t heard to many stories of people actually getting online with it). But what I’m more interested in right now is examples of use in the more rural areas of Africa.